I've got Dell e7450 with Intel HD5500 and FullHD IPS display. When I'm on battery, the screen starts to flicker at about 60%-65% of charge. Below ~50% the notebook is unusable, because the screen is almost still black. I've done some research and I think that Intel Panel Self-Refresh technology is causing the problem. But the real problem is that I can't disable it! I've tried many versions of drivers, both from Dell and Intel directly and I don't have Panel Self-Refresh option in Power settings in Intel Control Panel in none of them. I've got a friend with the same notebook and his got this option using same version of drivers with same OS. I even did a format and change OS from Windows 10 x64 to Windows 7 x64, but I still can't disable PSR. Please, help me and thanks in advance! Good research on your part and it appears to be a not uncommon problem. Yeah, I know that, belive me. 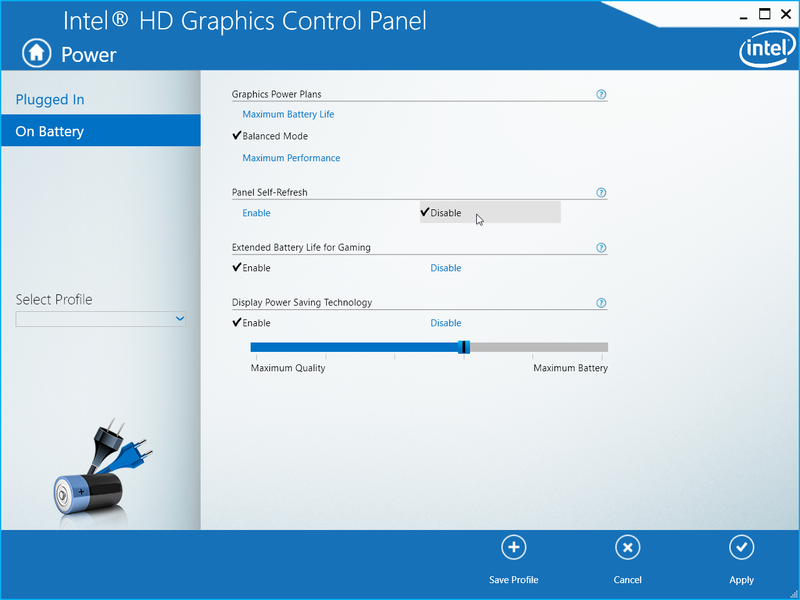 I mentioned that I don't have "Panel Self-Refresh" option in Intel Graphics Control Panel. Thanks for the information you have provided and the screenshots. Despite being in Polish the differences between the screenshots are very clear. I am unsure it this is a coincidence but our XPS users have noted that certain versions of the Intel graphics have removed options for advanced colour settings. Before we begin troubleshooting, we need to determine if this issue is hardware or software related, or perhaps both. a) Does the screen flickering only occur on battery? b) Is it only seen once the battery reaches a certain threshold? c) Can you run the battery down to about 50% and the shut the system down to off. Now hold down the D key and power on the laptop. It should cycle through a series of colours - Are the colours displayed perfectly or do you have the same flickering and mostly black screen? d) Can you connect up the ac adaptor and run the exact same test - Are the colours displayed perfectly or do you have the same flickering and mostly black screen? What version of the BIOS and the Intel graphics driver are you running? d) On ~40 On ~40% battery with connected AC adaptor the test worked all perfectly, without single flicker. @nillkin1 thanks for the update. As this issue happens across multiple driver versions from both Intel and ourselves, and another OS, that would suggest the issue could be related to the BIOS update. a) When did you update the BIOS? b) When did you update the graphics driver? c) For how long has this issue been happening? d) What BIOS revision is your colleague on? e) Do you have access to an external monitor, if so, is the flickering also seen on the external monitor during use? I'll drop you a private message to get your tag details from you. a), b) I did update all drivers. bios, etc. about a week ago c) The issue have been happening since I got a laptop - about 6 months, I bought refurbished one d) He's on A16 revision e) I did a test and the flickering is only seen on laptop screen Thanks a lot! @nillkin1 as the issues were present before the BIOS and driver updates, I suspect the issue is more hardware related rather than software. The issue I have is identifying exactly what component is causing the issue. For video issues such as this you would be looking at the main components i.e lcd, motherboard , lcd cable. As the issue only happens on the lcd but not external video that potentially rules out the motherboard. Logic would suggest that the LCD is the failing component, however the issue is not present during the LCD test. That would suggest that the issue potentially lies with the battery or the battery cable. Are you able to test your colleagues battery in this system to see if the fault still occurs?